With the environmental issues looming ever larger on our horizon, I was very happy to dig deeper into the matter with Daniel Rirdan's The Blueprint - Averting Global Collapse. This brand new (released less than a week ago) book is one big warning bell. 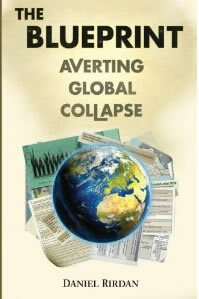 It examines environmental dangers one by one, draws conclusions, mostly tragic, and (a novelty!) suggests solutions. Overall it really is a blueprint for a new, beautiful if slightly utopian society, which aims at conserving the Earth while treating the humanity as humanely as possible. The Blueprint is divided into two parts: the first presents 'stressors', the other, much longer, looks at 'mitigation'. Basically, it is a comprehensive plan for total transformation of our world. Rirdan proposes new energy sources, means of transportation, production patterns, political systems, food creation methods, moral attitudes you name it. As the global collapse seems imminent, the plan is to be implemented immediately and maybe - but only maybe - we'll be able to avert the disaster. I will consider the book via its technological and social aspects. As far as the tech part is concerned, The Blueprint is fantastic. When I had no idea that half of the technologies described even existed, Rirdan weaved them into structures that actually appear workable. One can tell that designing such a plan took an amazing amount of research, creative thinking and attention to detail. If you ask me, the finished plan deserves serious consideration, especially now that we really are in a tight corner. When it comes to the social aspect, we are on a shakier ground, with the ideas ranging from unlikely to impossible. All of our history points to one conclusion - as a species, we are real scum. I can't visualise us suddenly turning into a pretty decent, socially responsible, happily cooperating global family. World government? Removal of the profit incentive without the removal of money? Worldwide general elections? Worldwide, radical revolution without resulting to violence? No can do. Don't get me wrong, I totally agree with Rirdan's moral stance and his criticism of the existing political and economical status quo. In fact, his condemnation of money-based reality is the best worded piece of social criticism I have seen in long time. Yet, I can see two basic problems which make his solutions unworkable. One - the level of international cooperation required for implementation of his plan is light years away from where we are now. We are not that globalised, I doubt if within a thousand years we will be. Two - appealing to the better instincts of humanity has low or non-existent chance of succeeding. Let's think up a plan based on selfish (but not necessarily monetary) gain and tangible benefits to each individual and it might just work. One thing remains certain - with our current levels of population and environmental pollution we are in serious trouble, headed for something even worse. As Rirdan himself admits throughout, his plan is only a starting point. A thought-provoking, multi-faceted proposition for solving problems we desperately need to deal with. We can work from here.